Submitted by mahoney on Tue, 09/23/2014 - 6:04pm. A list of Harbor Freight's store locations from their website http://www.harborfreight.com. 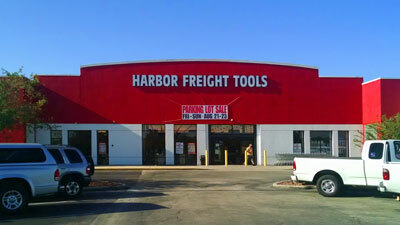 Harbor Freight was founded in 1977. They are the largest tool and equipment retailer in the USA. Originally submitted by kf4lar. Maintained by jpandcindy from 7/4/2012. Maintained by mahoney 9/23/14. Updated the file and added an additional 16 locations. Updated the file. Increase of 22 locations. Updated the file. Net increase of 21 locations. Updated the file. Added 12 new locations. Updated the file. Added 22 new locations. Updated the file. Added 31 new locations and removed 1 dupe. Net increase of 30. Submitted the correct address for the location in Virginia Beach,VA. Added 14 new locations to the file. Submitted a new location in Cheyenne,WY. Udated the file. Increase of 13 locations. Updated the file. Increase of 16 locations. Updated the file. Increase of 21 locations. Updated the file. Added 11 new locations. Added new locations in Nogales,Az,San Bernardino,Ca,Van Nuys,Ca,Nampa,Id,Zanesville,OH and Greensburg,Pa. Changed file maintainer from JPandCindy to mahoney. Added 3 locations: Prescott AZ, Longview WA, Tigard OR. Uploaded a new file with all the stores listed on their website at 06/30/2012.